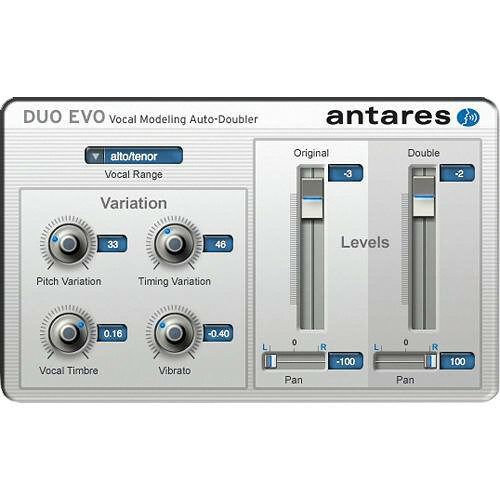 DUO Evo from Antares is a plug-in processor that generates a doubled vocal part from an existing vocal, and allows for programming variations in pitch, timing and vibrato depth in the new doubled vocal. For added realism, DUO Evo also includes a simplified version of THROAT Evo's vocal modeling to provide timbral variation for the doubled part. Functioning as an Audio Units, RTAS or VST plug-in for Mac OS X or Windows based audio software, the processor's output section provides independent control of the level and stereo position of the original and doubled voices. Note: Requires iLok USB smart key if one is not present on the system.